What's Up With Mark Zuckerberg's T-Shirt? 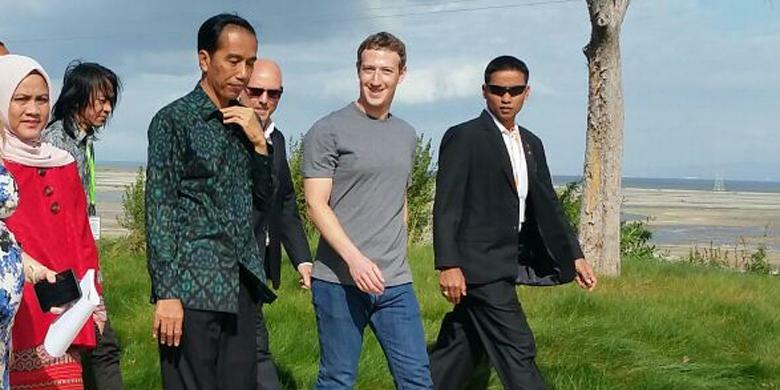 You may be surprised to see Facebook founder Mark Zuckerberg received the visit of President Jokowi at his headquarters by wearing T-shirts. You might think he's not polite. You are not alone. Michael Pachter, an analyst with a leading capital markets on Wall Street to the field of video games, social media, digital media, and electronics also agree with you. Pachter believes that Zuckerberg is not an adult with that style when he attended the IPO of Facebook on Wall Street by wearing T-shirts. For the Wall Street stock market players, a suit is the only appropriate clothing worn there. Therefore Pachter accused Zuckerberg disrespectful to potential investors, people who he had hoped would give him the money. The fact shows Patcher is false. The investors were not too concerned with Zuckerberg's appearances. Facebook stock are sold out, and the users are continues to grow rapidly. The question is why Zuckerberg chose to wearing T-shirts, and all of his T-shirt nearly identical? He gave the reason that every day he had to make so many important decisions related to their services to 1.5 billion Facebook users. He was ambitious to make Facebook as something very important, like we need the electrical energy today. So, he chose to use his mind energy only for important things associated with the service earlier. Zuckerberg may said, if you are thinking about what clothes are going to be used, adjust the various events going on is something "stupid". Or in our language, it is a waste of time and money. For those of us who work with a simple rhythm, we would have enough energy to think about things that are not necessary. But for people who are super busy, make tens or hundreds of decisions every day, life gets really tiring. They are experience something called "decision fatigue", because of the decision-making. They need to make a simple of things, so it no requires energy to think about it. Actually, Zuckerberg is not alone. Obama is thinking the same way. Which differ only in the choice of clothing. Obama chose a blue suit as identity. Of course, Zuckerberg is not the first. Steve Jobs are familiar with the turtles collar shirt, while Bill Gates often appears wearing a sweater. Zuckerberg's just a little more extreme, both in the choice of his clothing type or the color of clothes. We used to judge a person by the clothes he was wearing, not the substance contained in these figures. On the other hand we are also often faced with the fact that the image who built through by dapper makeup is not always true. Many people who have been deceived by this, but it still doesn't change the perception initially. That perception seemed to be dismantled by Zuckerberg through a T-shirt he was wearing. He wanted people to see the quality of the products and the service he gave, and not the clothes he was wearing. A fashion analyst commented, "When you're a massively proven success, you get to break the rules." If Zuckerberg dressed like Lady Gaga, people will continue to use his products, and still buying Facebook Stock. Zuckerberg is a remarkable figure, who standing in a superb position, then he can break the rules that bind the ordinary people. MicroSiv™: What's Up With Mark Zuckerberg's T-Shirt?